Dr. Christine Tran grew up in Anaheim, California. 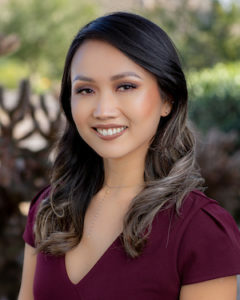 She stayed local to southern California during her education and attended UCLA where she received both her undergraduate degree in bioengineering and her Doctor of Dental Surgery degree. She spent a year in Sacramento and completed a general practice residency at the Veteran’s Affairs Dental Clinic. She recently relocated to Phoenix to be with her dental school sweetheart. Dr. Tran’s interests in science as well as art have shaped her unique perspective and approach to dentistry. Dentistry combines her love of artistry and craftsmanship with her aptitude for science and problem solving. As a result, she is extremely passionate about her work and takes immense pride in delivering quality care that is both functional and esthetic. Beyond the technical aspect, her favorite part about being a dentist is communicating and developing strong relationships with her patients. She enjoys helping her patients understand the value of oral health and enabling them to achieve their goals. In her spare time, she enjoys sewing, pottery and other crafts. She also loves to hike, play tennis and travel. FUN FACT: Her first job was at Disneyland, working at the shops inside the park.